After trying out a traditionally deep-fried nutella doughnut and loving it, I wanted to make a baked version that was just as delicious but not as naughty. I'm not saying these are good for you but they are definitely better than their deep-fried counterparts and with the cinnamon sugar topping they taste exactly like them! 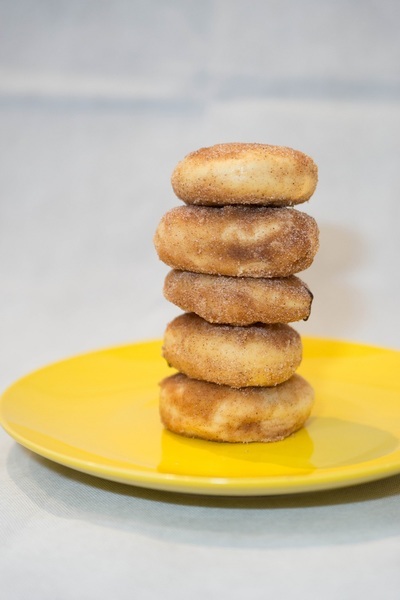 The texture of these doughnuts is soft and fluffy and the cinnamon sugar is heaven. Use a piping bag to get the nutella in the middle of them and eat warm from the oven or on the same day. This recipe is slightly adapted from Mel's Kitchen Cafe. Put the warm milk in a mixing bowl and stir in the yeast and sugar. Add the butter and then gently mix in the eggs, flour, nutmeg, and salt. 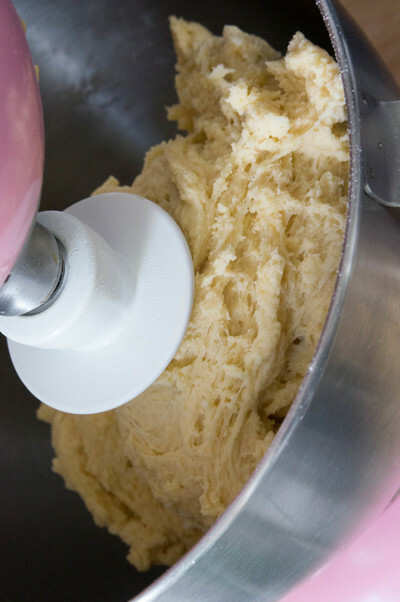 Using a dough hook attachment, mix the dough for 2-3 minutes until the dough comes together and is soft and smooth and doesn’t stick to the side of the bowl. 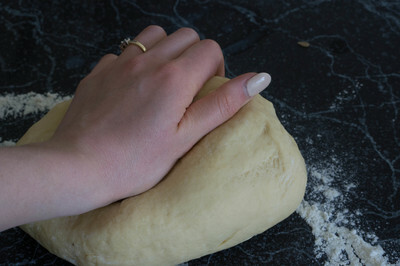 Remove the dough from the bowl and knead by hand on a lightly floured service for a few minutes. Place in a lightly greased bowl and cover with clingwrap. Let the dough rise for an hour or until doubled in size. 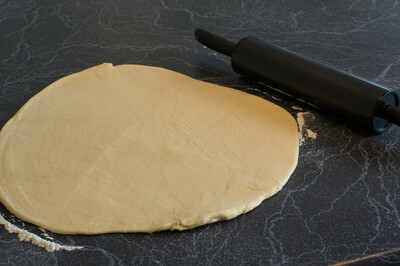 Punch down the dough and roll it out to about 2-3cm thickness on a lightly floured counter. 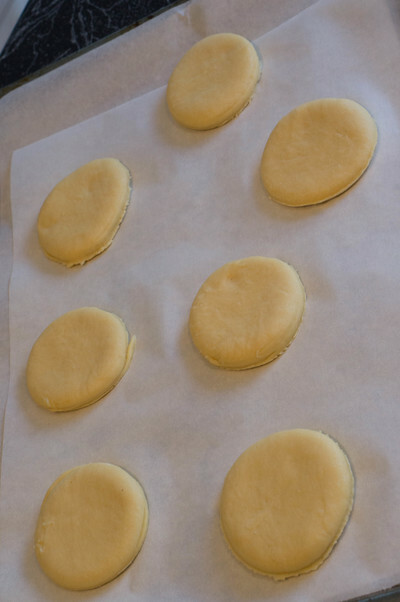 Using a large circle cookie cutter or the rim of a drinking glass, cut out circles in the dough. Cover a baking tray with baking paper and spread the doughnut circles on the tray leaving a few cms gap between them. At this stage you can cut out holes in the centre if you want to make normal shaped doughnuts and not fill them. Cover the tray with lightly greased wrap and leave doughnuts to rise again for another 45mins-an hour until doubled in size again. Bake at 190 C for 8 to 10 minutes. Start checking the doughnuts around minute 8 as they should still be pale on top and barely baked through. Remove the doughnuts from the oven and let cool for 1-2 minutes. Meanwhile melt the butter for topping and in a separate bowl add sugar and cinnamon. 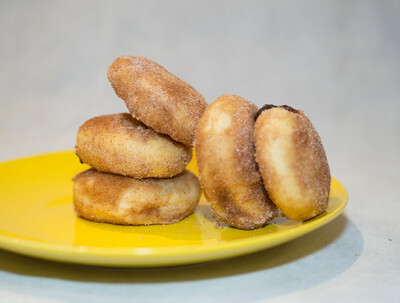 Dip each doughnut in the melted butter followed by the cinnamon sugar and shake gently to release any excess. Poke a hole in the side of the doughnuts with a skewer and pipe in the nutella. Enjoy warm from the oven.